I am working on a new series of books for the lever harp. Microjazz is an extensive series of books written by Christopher Norton for the piano and is being adapted for the lever harp. The series will include solo books for all levels of players, duets and trios. It is being published by 80 Days Publishing. I am at present working on the sound track for an animated video with SANDS-Lothians. SANDS-Lothians is a local charity providing support for bereaved parents. Kate George is the graphic artist and illustrator creating animation for this short project. For more information about SANDS-Lothians click here. The Craighouse Suite is a multimedia performance featuring clarsach (lever harp) and string quartet, along with illustrations drawn to display the music and the history. 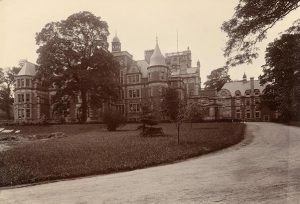 The music, written in 6 movements, evokes the history of Craighouse in Edinburgh, from its time as a lunatic asylum to its use by residents of Morningside as a recreational space. Craighouse has in recent years fallen into disrepair following its purchase by developers but its sense of history remains. Drawing on memories of former patients and images from the archives the music and original art work explore the sense of time and space created by familiar buildings and looks at how they bear witness to history. Music by Elinor Evans and illustrations by Sophie Chatham. Photo above: an archival image of Craighouse. The Craighouse project was performed in the Edinburgh Fringe Festival in August 2016 to a very appreciative audience.